Had near 40 ppl online tonight was a good night, we introduced Cruor Buffs, KI and a Brand New Shinryu BCNM! - Roughly 80 Missing NM's were added to Abyssea with their loot pools. - Remaining Missing Abyssea EXP mobs were added. - KI's and Atma added to all Abyssea NM's. Legion, I wanted to ask, do you contribute these updates to the darkstar project? Not accusing, just wondering, because I am not sure how much of your stuff is custom or not acceptable for the project. If not, do you happen to have your own repository fork? I would like to try to pull some of the updates you have done if they are not project acceptable. Delaide wrote: Legion, I wanted to ask, do you contribute these updates to the darkstar project? Not accusing, just wondering, because I am not sure how much of your stuff is custom or not acceptable for the project. If not, do you happen to have your own repository fork? I would like to try to pull some of the updates you have done if they are not project acceptable. We do contribute to the project however since most of our NM and gear are under different IDs as well as SOA content it to my knowledge is not considered for the project. There are currently several trusted members working with us to complete abyssea and get it ready for DSP, but that is most likely several months away from fruition. Excellent server with an awesome community. Have gone through TONS of exp. parties with them and have been having a blast. The content isn't "hand me" either, makes you earn things through time and contribution! Will make this my permanent home for a bit. The GMs are nice, they're helpful with questions, and the community actually assists. HIGHLY recommended, my character name is Argus, if you need to look for a leveling partner. ~ Custom Trials added for Relic and AF Reforge. ~ Lunar Abyssite and Atma system in. ~ Retail Abyssea pop system implemented. 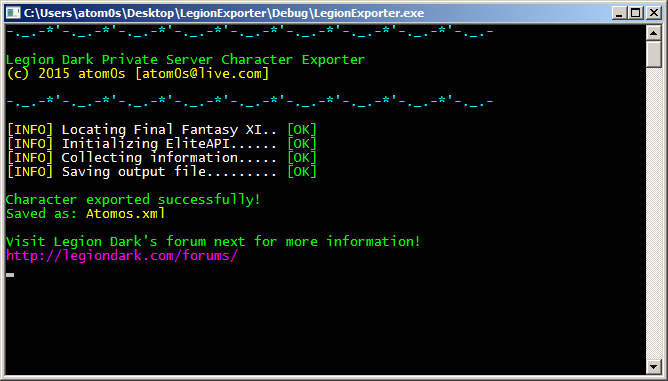 Announcing the LegionDark Server Transfer Tool or STS for short. The purpose of this tool is to make migration from other servers to Legion a simple process. STS is a new service exclusive specifically to LegionDark that allows character data to be transferred from ANY server platform, no more losing all your progress if you choose to change or move to LegionDark. ~ This service if for new characters only and cannot be used to add items or progression to current players. Looking to hang out and have fun, a lot of servers are just "EZ Mode." for people who want things handed to them. I think this server will give me the challenge I want, but also the fun I am looking for, can't wait to meet some of you in-game!